New social apps are always trying to break through to superstardom, but in a competitive landscape, networks need to come equipped with something that truly sets them apart. It appears Meerkat has done just that. 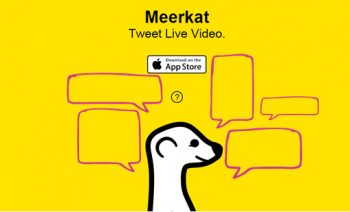 If you haven’t heard about Meerkat yet – don’t worry. The new social app, which allows video streams to be published to followers in real time, only debuted this month. But thanks to major publicity through SXSW and brands and fans onboarding organically – the app reportedly has been doubling its user base daily. Here’s how Meerkat works. You can live-stream video content from your phone to your followers. The mobile application sends out push notifications to your followers, alerting them that your live-stream is about to begin. That’s another thing – Meerkat – like Snapchat – is currently one-time-use only. If you don’t watch a stream as it broadcasts, you miss the opportunity to watch it at all. The intrigue built around Meerkat as Twitter acquired a similar service (Periscope) and cut off Meerkat’s access to the social graph, which enabled the notifications to followers. That has since been recovered – and newer apps like Katch are gaining traction, as they offer a way to watch live-streams after the fact on YouTube. Just watched @jimmyfallon live stream / practice his opening monologue for tonight’s show on @AppMeerkat with 3000 others. Amazing. Billboard utilized Meerkat to capture a quick visit with country singer Kelsea Ballerini. Offering its followers a behind-the-scenes view of her performance gave the event an “exclusive” feel. @billboard thanks for jamming with me! Red Bull has always been known for successfully hopping into new social trends (it’s among the 30 most popular branded Instagram accounts). 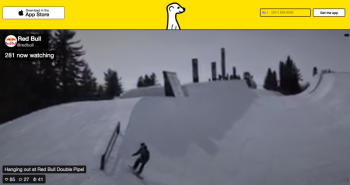 With Meerkat, the energy drink brand made its debut live streaming a behind the scenes view from its half pipe competition. 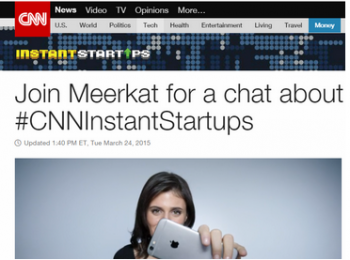 Meerkat doesn’t simply have to be about entertainment – CNNTech is using it as an educational platform. The network provided a live chat with Meerkat’s founder Ben Rubin to learn more about the app as part of its Instant Startup series. Politics aside – this was important because its the first instance where a politician is using the new app. Sure, he’s not a brand per se, but he was certainly going for a branded image, and the former Florida Governor utilized Meerkat as a way to spotlight a speech in Atlanta. Dan Pfeiffer, former Assistant to the President of the United States and Senior Advisor to the President for Strategy and Communications has predicated Meerkat will be a gamechanger in the 2016 presidential election. It’ll be interesting to see if candidates are willing to test out the new platform to reach even more audiences. Remember Ello? FourSquare? These networks at the time appeared to be a big deal, but ended up having little impact on social marketing in the long run. Before you decide to jump on the bandwagon of yet another new social channel, think about if Meerkat could actually benefit your strategy – or if you’re simply doing it to join the crowd. Hosting an interview or speech. Do you think Meerkat has the potential to be “the next big thing?” Let us know what you think in the comments.